many nba fans are asking why ray allen, al jefferson, carmelo anthony, and david lee were not included as all-star reserves for their respective conference. 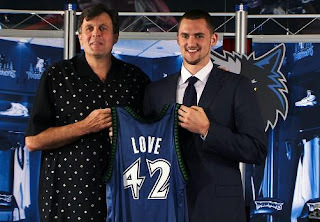 but is anybody concerned that kevin love gets no love after being left out of the rookie-sophomore game? sure, he cannot score in bunches like oj mayo, michael beasley, and eric gordon (yet), or set up plays like derrick rose and russell westbrook, or fly high like rudy fernandez. but i bet he makes a better case to be in the rookie sophomore game at the all-star weekend than marc gasol, greg oden, and brook lopez. the twolves are the best team this year in the nba. yup, you read that right. this year, minnesotta has won 8 and only lost 2 games giving them the best record so far this year (but not this season :P). this surge would have been enough to push love to the game. no one can say that it's about the team record as eric gordon's clippers are also struggling. maybe they are basing it on numbers. if so, then love should get the vote over oden as they have almost identical averages in scoring and rebounding. the difference is that kevin love leads all nba players in offensive rebound every 48 mins. i don't know why love is snubbed but i do know that he deserves to be there.